During the Michigan Press Photographers Association contest, this photograph leaped out to all of us on the panel. 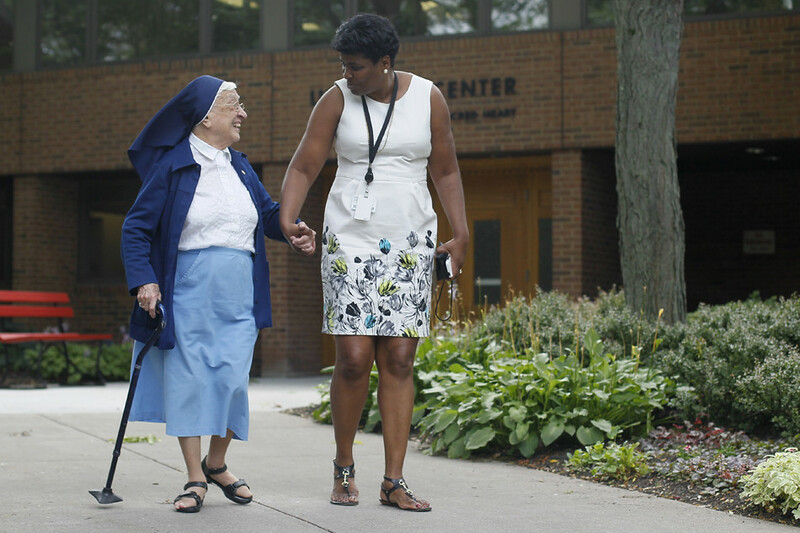 What an amazing image, especially given her position as a nun. Can you tell the back story to the image? First off Ross, thank you for having me on TID. It has been such a great resource for me as a photographer, and I am incredibly honored to be a part of it. 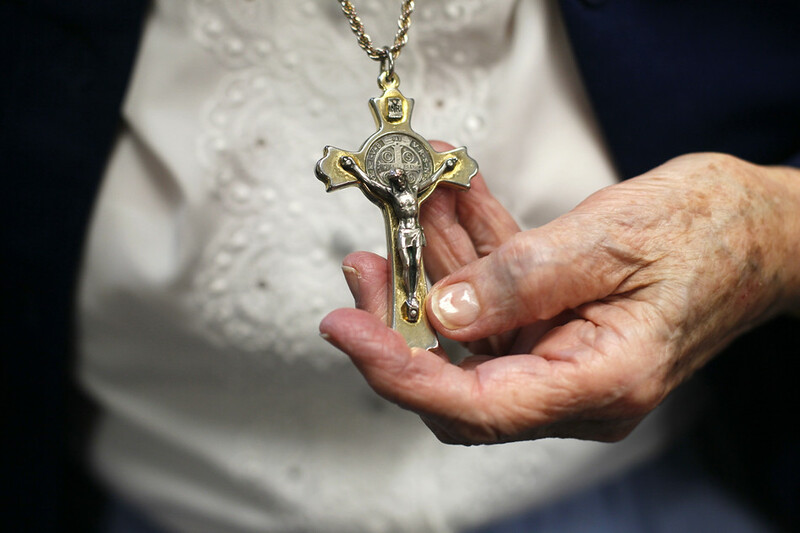 I was working with a reporter at the Toledo Blade (where I interned summer 2015) on a story about declining numbers of women entering religious orders. 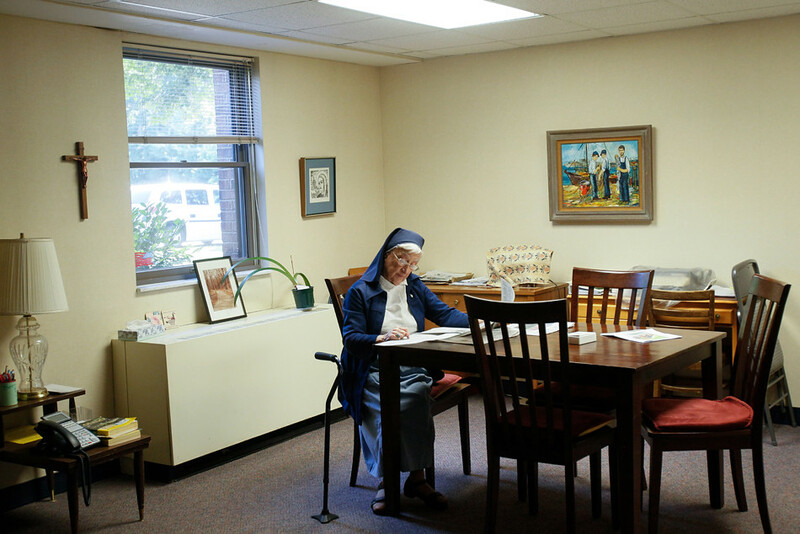 We went to the Ursuline Center, where we met with Sister Antoinette Cosentino, who entered in 1937 and instantly I wanted to hang out with her more. She's quite the personality. 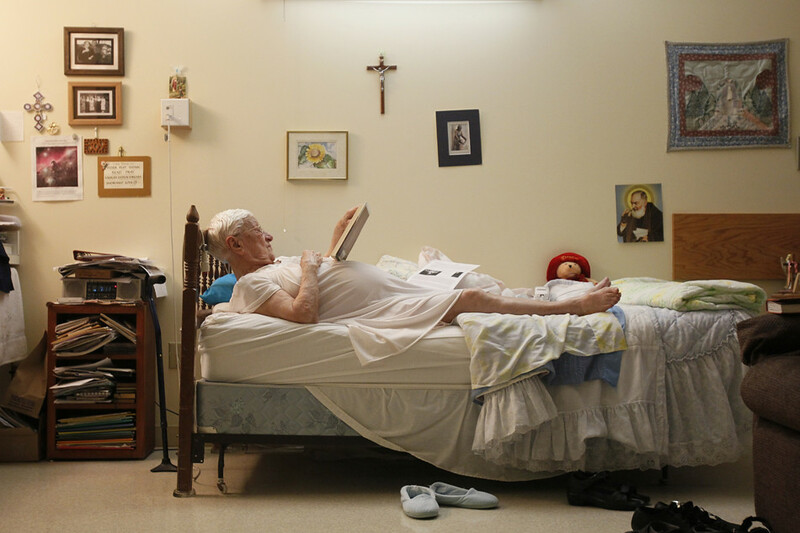 I set a goal for myself on my internship to create a photo story and I've always been fascinated by religion, so I gravitated to doing something more in-depth on Sister Antoinette and what her daily life is like. She showed me her room, and I knew I needed to find a situation to photograph her in it. Her space really shows who she is. It took some time, but eventually I was able to capture her in the evening before bed and in the morning when she woke up. This image is from one of the evenings I spent with her. This project involves a lot of logistics/planning? Can you talk about your initial stages? First, I sat in with the reporter on her interview with Sister Antoinette. I am a photojournalist, not a just photographer. Too often reporters and others think we are button pushers. Yes, making a beautiful image is important, but for me, I try to focus on the story. There has to be more there for me than "Oh, this looks pretty." I wanted to have thorough and rich captions. I also did follow-up interviews with her to help tailor my information to what I was seeing visually. I love putting quotes in my captions. It's important to set an initial interview to have a course for the story. Stories are overwhelming and you need to narrow down moments. It helps when you have a full picture of what this person was like. Often times as a newspaper photographer the luxury to spend as much time as you want isn't always there, so you have to plan accordingly. You don't need to always spend years or months (even though that would be nice). Sometimes it's about using time wisely. In our initial interview we also met with the folks who run the nursing home she lives at and they were happy to have us there, which was nice to have an understanding of this is who we are and this is why we're doing what we're doing. I had no problems with the staff. I can’t say that I’ve ever seen such an intimate moment in a nun’s life (or least, in recent memory). With each visit you made, what advancements did you make mentally to set the stage for deeper access? I tried to go as often as I could and Dave Zapotosky, the chief photographer at the Blade, was supportive about giving me the time to go shoot. It helps to have an editor believe in your project. I would try and go between my other daily assignments. A few visits, I barely took any pictures. She would give me a tour of the nursing home and tell me all about the art. We would sometimes color notecards for the notecard quilt they were making for a bulletin board. We'd read the paper together and talk about some of the stories. She'd ask me to point out which pictures were mine in the paper. I got frequent art tours. I think she would sometimes forget that she had already shown me the art. She's incredibly lucid for her age, but she had her forgetful moments sometimes. In-between shooting we would talk about our lives. She asked me lots of questions. Usually within the first ten minutes of our visits she would have something new to show me or tell me about. I enjoyed visiting with her. We built a friendship during the course of this story and I was frequently asked if I'd be coming to mass each Sunday. It's not the camera that connects with your subjects, it's you and sometimes that means letting your guard down and sharing some of yourself. Taking the time to invest in the relationship lead to better pictures. The photo of her bed most certainly was not the first shoot. 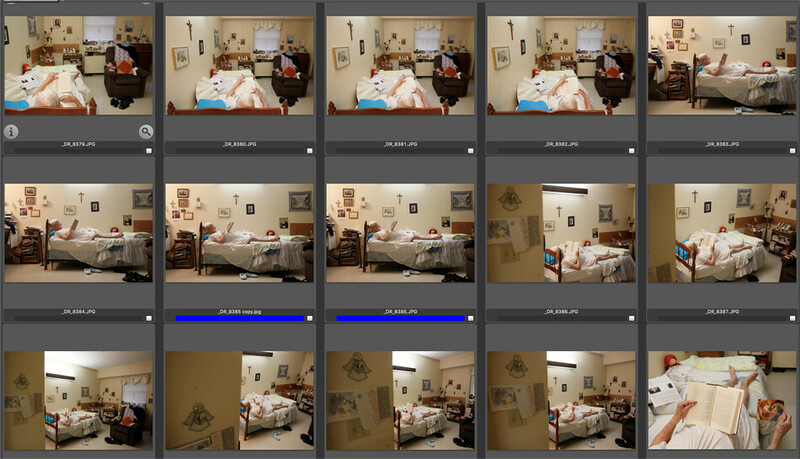 Documentary work always includes problems that emerge. What problems did you encounter and how did you overcome these problems? Luckily I didn't have access issues. The nursing home was aware of my presence and aware of what I was doing and was okay with it. She also goes to two other nursing homes to give communion. One of those homes the individuals there are not their own legal guardians, so I decided to go with her to the other nursing home, to avoid any issues of getting access. It's much easier to be able to talk and get permission directly from the person you are photographing then to have to go through the hoops of getting permission from the home and from the legal guardians. I also knew that the photos at either home would be fairly similar, so choosing one of the other wasn't drastically different. In terms of the photo of her in bed, it took awhile to make that picture happen. I had maybe four visits before I photographed her in the evening. That first attempt I think she felt like she needed to entertain me and was doing activities with me. After our visit I asked her what she would normally be doing if I weren't there and she said reading. So I told her that the next evening I come, she can just do what she normally does and that she didn't have to worry about having activities planned for me. The second try is when I made that picture. While I'm fascinated by religion, I am not in the slightest bit religious and many of her views are polar opposites of mine. She'd often talk about various issues such as abortion or gay marriage and I would steer the conversation in other directions. I would listen to her opinions and move onto other topics. I'm not there to get into big debates or insert my own opinions on a subject. Even though her and I come from drastically different times and systems of belief we could still find common ground in other things, like those pesky squirrels always stealing food from the bird feeder in the nursing home garden. In terms of when it came time to print, it was decided by upper management not to run the in bed photo because it was seen as a possible offense to readers. The photo department fought for me. Unfortunately that photo never saw the light of day in print. By in large, how did people receive your presence? How did she receive your presence? Nearly everyone in the nursing home knew me and with multiple visits others became even more comfortable with me being around. At first I was the weird new lady with a camera. Then I just became the less weird and recognizable lady who was there for mass and to hang out at breakfast occasionally. People would ask what I was doing and I would chat with them and they always had something nice to say about Sister Antoinette. She's kind of the head nun in charge so to speak, helping get things ready for mass. Sister Antoinette was incredibly open. If I hung out with her in the evenings, she'd just excuse herself to go shower and change and then she would invite me back into her room. When the story was coming to an end and I was going to the nursing home less frequently, she would call me to see how I was doing and when I was coming to visit. It was also great to see how excited everyone else was about the story. One of the gentlemen who worked at the front desk pulled me aside to tell me about how much she talks about me and that I have no idea how much this story means to her and everyone else. That was touching. I felt part of the community there and was always welcome. Now, onto the moment. Please walk us through how you photographed the moment (what was going through your mind and what body language did you use, etc.). I tried everything with that moment. Every angle, every lens, every distance. I knew I might not get that moment again, so I made the most of it. I took some tighter images of her reading, but I didn't feel they were as effective as the wider shots where you could see how her room was decorated. 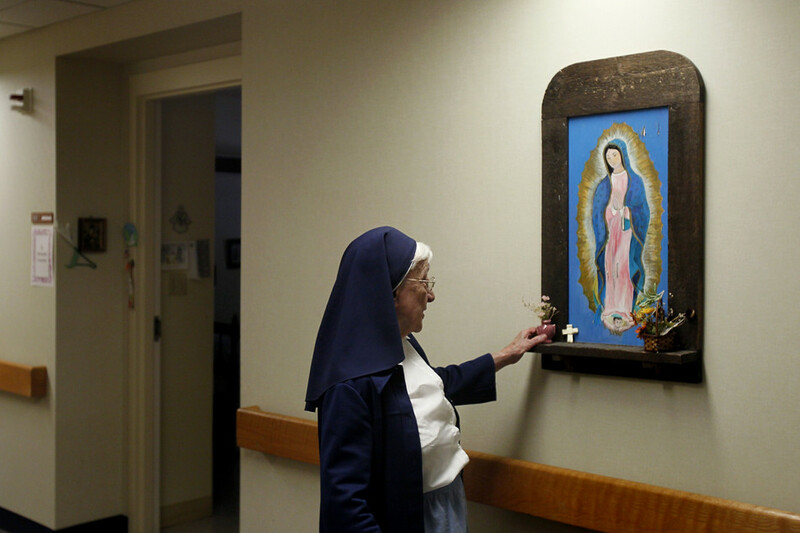 Even though she isn't in her nun clothing, you can still tell she's incredibly religious. She was natural around me and seemed to be engrossed in her book. We barely spoke, and it didn't feel awkward at all. I did not want to engage in too much conversation because I didn't want to pull her away from what she was doing, given the last time I was with her in the evening, she felt she needed to do stuff with me. It felt incredibly personal and it was important to me that I shoot in a way that is respectful. I started close and slowly made my way further back. I consider myself a methodical shooter and I will often times spend a lot of time waiting for a specific picture to fall in place. I'm a firm believer of getting it right as much as possible in camera (including shooting it the way I want it without having to crop too much), so I'll often try out various exposures to see what I like best. I hate editing on the computer, so I try to stay away from that as much as I can. You’re relatively young in the profession. 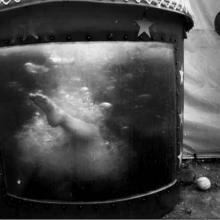 What have you learned about yourself as it relates to the photographic journey? There's a lot of distractions as a young photographer — awards, building a brand, prestige, making a name for yourself, feeling like you need to make pictures for someone else. I guess those can be distractions for older photographers too. What I've learned is none of that matters. What matters is the story and the lives you interact with and touch. Awards are just something to stick on a resume and wall. Your brand, your name will change and the prestige that comes with it may ebb and flow. I'll never be the best. I may be the best in one moment, but someone else will come along and be better, so there's no reason to stress about such things. I'd much rather make an impact on the community than make a name for myself and I think that has helped me learn to focus on my own personal growth rather than comparing myself to others. When I first started I looked at those above me and was frustrated I wasn't there yet, even though I knew what I wanted to do visually. Why? Why can't I make pictures like that? It just took time and patience to get somewhat there. I definitely have a lot more to learn. I look forward to seeing who I am as a photographer ten years from now. I have a feeling I'll still be my toughest critic. I also learned to make pictures for myself and to not let others project things on me. I worked on a story about a Michigan State women's basketball super fan with Down syndrome and a big critique I got for that story was I didn't go enough into the Down syndrome portion. At first I agreed with that, but then I realized, "No, that isn't her story." Her condition doesn't define her and the girl I met was a vibrant, wonderful young woman with an intense love for women's basketball. To paint it as a, "feel sad because she has this condition" story didn't feel right. Granted, I could have gone a lot deeper in that story in other ways, but it's a learning process. I've learned that all you can do is ask. Some people say yes, others no. I'm always in awe when people let me into the most intimate parts of their lives. I get so happy when I see when people get excited about being in the paper or learning something new about themselves or their story. There's many families I can think of that have my photo spreads on their wall and to know you made something that someone will treasure forever is really beautiful and I just absolutely love what I do and how I get to meet so many wonderful and unique people. People want to tell their stories. It's our job to listen. I know it's going to sound so cheesy, but I'm reminded of the song in Pocahontas sung by the Willow tree, "Listen with your heart... you will understand." Making any type of work, you have to stay true to yourself. I will never see the world like some of my photo heroes because I am not them and that's okay. I can only stay true to my vision. Also, spoiler alert, we're all insecure (some of us openly, others behind closed doors). You just have to get over it. It'll all make sense eventually. You just have to trust yourself. 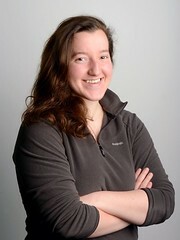 Julia Nagy is a staff photographer at the Lansing State Journal in Michigan and a student at Michigan State University. Nagy is an Eddie Adams Workshop Class of XXVII alumna. She has interned at the Toledo Blade, the Omaha World-Herald and the Natchez Democrat in Mississippi. Her work has been honored by the Michigan Press Photographers Association, the Michigan Emmys and the Associated Collegiate Press. Recently, she was named Michigan's College Photographer of the Year by the Michigan Press Photographers Association for her photographic body of work in 2015.